On Monday, March 25th, Urban Land Conservancy (ULC) closed our office in celebration and remembrance of Cesar Chavez. Born in 1927 in Arizona, Chavez was a first-generation American who grew up as a migrant farm worker after his family lost their home and farm in the Great Depression. Today, Chavez leaves behind his reputation as an American labor leader and civil rights activist who was a prominent voice for unions, particularly migrant workers, in the latter half of the 20th Century. Cesar Chavez at the Democratic Convention in 1976 in New York City. Photo Courtesy, Wikimedia Commons. After joning the U.S. Navy in 1946, Chavez launched his career as a community organizer in the early 1950’s. As a former migrant worker throughout his youth and early adulthood, Chavez strongly advocated for worker’s rights and soon became an organizer for the Community Service Organization (CSO). 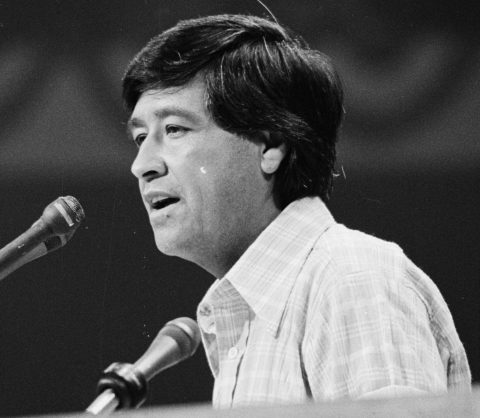 In partnership with Dolores Huerta, another labor leader, Chavez founded the National Farm Workers Association, later renamed the United Farm Workers (UFW) union. UFW organized some of the largest agricultural strikes in U.S. history, winning higher wages and more equitable treatment of agricultural workers. Chavez always advocated for nonviolent protest and civil disobedience to effectively bring about grassroots change. The ideals for which Chavez fought are still applicable today. Efforts to mend our current immigration system, raise the minimum wage and improve workers rights are applicable across the country. On the fourth Sunday of each March, ULC celebrates Chavez, and his legacy of giving a voice to the voiceless, and organizing people to fight for their collective benefit. At ULC, our focus on serving disinvested communities directly aligns with many of the ideals for which Chavez worked his entire life. Each year, ULC is proud to honor Cesar Chavez as we continue to remember his numerous achievements and lasting legacy.